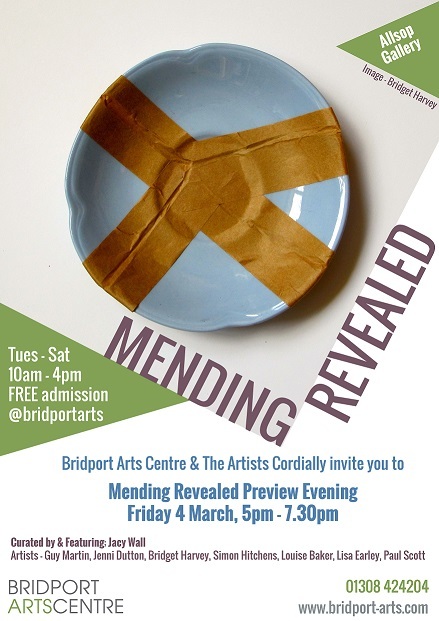 Camberwell, Chelsea and Wimbledon research student Bridget Harvey will be exhibiting at Bridport Arts Centre between 5 March – 16 April 2016 in a show called ‘Mending Revealed’ curated by Jacy Wall. Artists Louise Baker, Jenni Dutton, Lisa Earley, Simon Hitchens, Guy Martin and Paul Scott are also all involved in the exhibition. “In The Craftsman, Richard Sennett suggests that ‘a model is a proposal rather than a command. Its excellence can stimulate us, not to imitate but to innovate.’ (2009, p101) Through the creation of repair models, I propose ways of approaching repair and repairing, sometimes functionally, sometimes not. My repaired or remade objects are considered but not excellent per say, through my work I have rendered many of them not-excellent, possibly even anti-functional. My mends are idiosyncratic – some verge on idiotic – they do not make the object typically useful again. Bridget studied on the MA Designer Maker course here at Camberwell and graduated in 2013. Since leaving the college she has taken part in multiple residencies and exhibitions, she also works closely with our MA Designer Maker course staff, holding workshops and sessions with current students.